This week the shaving brand Gillette launched their latest advertising campaign inspired by the #MeToo movement. The new campaign encourages men to end a culture of toxic masculinity. It plays on the brand iconic 30-year tagline “The best a man can get” replacing it with “The best men can be”. The concept behind this adapted tagline is to help create a new standard for boys to admire and men to achieve. The advert entitled “We Believe: The Best Men Can Be” depicts scenes of bullying, sexual harassment and sexism in films and boardrooms. The voiceover challenges the phrase “Boys will be Boys” to excuse this behaviour. The new campaign has been met with a lot of praise for taking on the social issue of toxic masculinity. Bernice King, daughter of the late civil rights legend Martin Luther King, tweeted her positive reaction stating that the advert is pro-humanity. Not everyone shares a positive outlook. The short video posted on YouTube has received a total of 11,453,907 views has received 273k thumbs up and a staggering 658k thumbs down. Some users are labeling the campaign as "feminist propaganda" and even going as far as boycotting the brand. 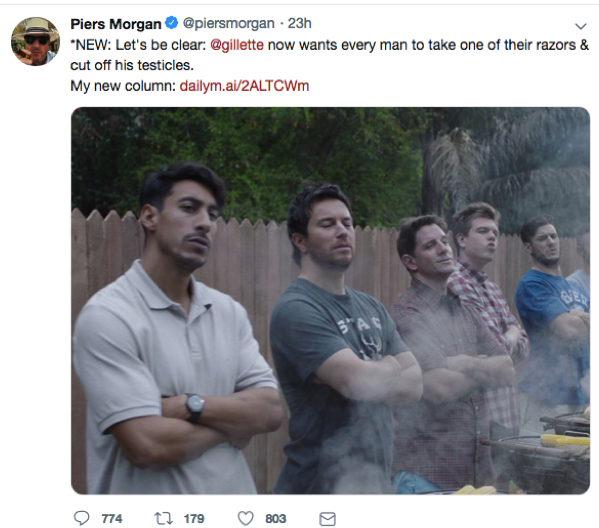 Professional complainer Piers Morgan has also shared his distaste in the advert urging the brand to “Let boys be damn boys. Let men be damn men”. 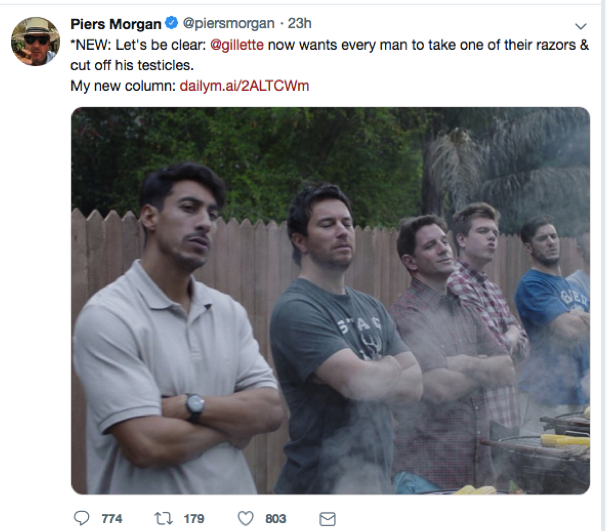 Gillette, owned by Procter & Gamble, commented on the campaign stating that it is part of a broader initiative for the company to promote “positive, attainable, inclusive and healthy versions of what it means to be a man”. The official Gillette website states “It’s time we acknowledge that brands, like ours, play a role in influencing culture. And as a company that encourage men to be their best, we have a responsibility to make sure we are promoting positive, attainable, inclusive and healthy versions of what it means to be a man”. 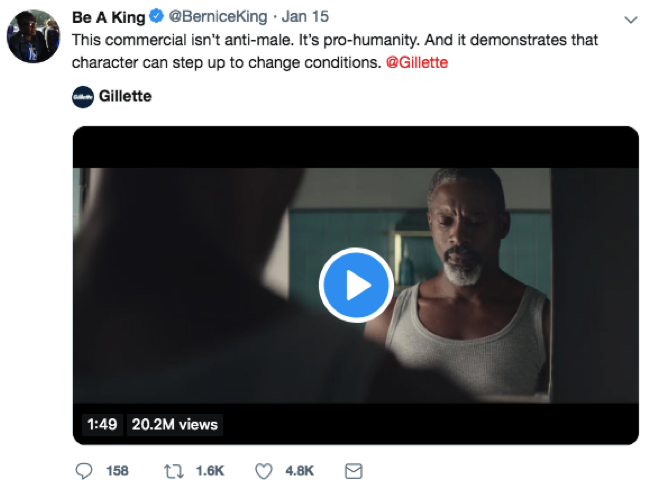 Gillette isn't the first brand to face backlash for taking a clear stand on a social issue and encouraging social change. At Christmas Iceland discount supermarket partnered with Greenpeace for an animated short film featuring an orangutan who describes the destruction of his habitat the rainforests as a result of palm oil production. The advert was banned on the grounds of being “too political”. Whether or not you are a fan of the Gillette advert, you have to applaud the brand for opening up the conversation and highlighted a common societal issue surrounding gender stereotypes.